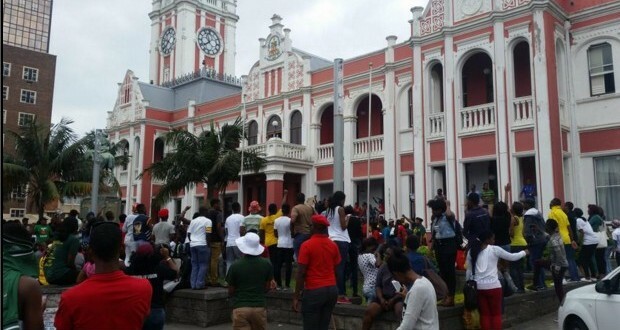 Students at University of Fort Hare (UFH) haveÂ joined their fellow students around the country in protesting against increases to tuition, registration and residence fees. The students at Fort Hare are protesting against the threat of academic exclusion as a result of outstanding fees. On Wednesday, however, university management agreed to withdraw the ultimatum for students to pay at leastÂ 60% ofÂ their fees in order to sit their exams. Despite this concession the DASO-run SRC says theyÂ will be joining students around the country in protesting against fee increments. They have threatened to also bring a halt to operations at the university if management does not give them what they want. The issues at Fort Hare run even deeper than just fee increases. Earlier this year, more than a thousand students were told they would be barred from writing exams because they had not paid their outstanding fees. The money that was due to be paid to students for financial aid was apparently being diverted into the bank accounts of staff. Fort Hare has been under immense financial pressure and used the money from NSFAS (National Student Financial Aid Scheme) to pay their staff. The fee increases for Fort Hare have reportedly been between 8% and 15% and the residence fees are particularly unpredictable because the residences are outsourced. Kabelo Mogatosi, the DASO Eastern Cape Constituency Chairperson, says that the issue of fee increases is not something that has started recently but has been an ongoing issue since before the DASO-led SRC even came into power in UFH. He says that the organisation took R15 million worth of NSFAâ€™S funds to pay for the salaries of faculty. Mogatosi says that the students want accountability as to where the money went. He also said they hope to resolve the issue before the exams start because they will then be disadvantaging the very students they want to help. DASO are hoping the protests do not become violent and they just want the council to convene. They want to exhaust every possible avenue before they have to take it to the extreme. The SRC and management at the university met on the 19th of October to discuss the fee increments. Busisiwe Mashiqa, the SRC president at Fort Hare says that the meeting that took place between management and the SRC was an open meeting and the meeting took place in front of students. However no resolutions could be reached between the parties and the protests at the university are going to be carrying on. All operations at the university have been stopped including the campus in East London and the main campus in Alice. Mashiqa says that the students are resolute in their actions that they want 0% increments up until the management informs the students about the money that they took from students last year. They just want management to answer the question regarding the money that was taken from the students. Only after that does Mashiqa say they will sit down with management and try and reach a compromise. The SRC and management are due to meet soon but Mashiqa says the management wants to observe the situation, which she does not understand as the students are protesting peacefully. Mashiqa was on the move at the university and as such could not give a full interview.